I’m heading to a more sensible crossing back into Chile. At the border I fill in the forms, and the guard comes out to check the vehicle. It soon becomes obvious that I’m unwittingly breaking bio-security rules by having soft fruit in the car. I should have known better, having sat on the bio-security working group of St Helena Island. Even worse, I’d helped with bio-security on ship days when the RMS St Helena returns from Cape Town. The language barrier was broken with the threat of fines. But my inherent Yorkshireness shines through. In the end the guard can’t bring himself to fine the intellectually afflicted. I reach the park an hour before it opens so drive to Camerón. This little village sits on a rocky coast with a kelp-laden shallow sea. Small birds flit along the shore; the shrill-whistle of an oystercatcher pierces the air. Out to sea, black browed albatross and giant petrels do vertical oscillations that make flying seem effortless. On the shore deep beds of seaweed hide pools of water. My shoes are soaked but I carry on. Rock shags come and go from the thinnest cliff ledges. As they return from seaward forays they stretch their legs forward using webbed feet as air breaks while they prepare to land. Near fledgling chicks watch me as I walk beneath them. I spend an hour or two at Camerón before driving back to Parque Pinguino Rey. The wind here is a whole new phenomenon. On some occasions a fleet wind overtakes my car, dragging the dust I’ve stirred to the front where it spindrifts into my view. With all but meagre vision I slow the vehicle till it subsides and then I start again. But here the wind takes on a new level of fierce. It comes in strong, interspersed with angry gusts. The sea is green topped with simmering froth. It rises in heavy waves that feel as though they could be pushed all the way to the other side of the island. Three foxes are hunkered down in grassy hollows. They allow me to get within a few metres. I lay close and snap photo after photo. The scene doesn’t change much, the foxes occasionally yawn, yet I seem programmed to take hundreds of photographs. The beauty of digital – you could never have got away with such flagrant indulgence using film. Hunkered down in the vegetation with the foxes is one thing. Out in the open is different. When I take off my gloves my hands are pained by the wind before heading towards numbness. I manage three or four photos at a time before having to give up. The scene here is exceptional. 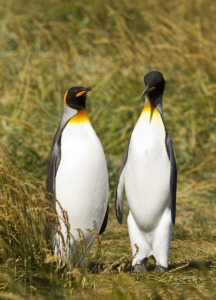 King penguins huddle together or walk against the wind. Their sea-evolved feathers and thick layers of fat pushed back against them so you see each detail of their figures. Occasionally one leans back to its partner and they cross bills in an affectionate moment. All this is set against the backdrop of a sea rising up with impending violence. This is a wonderful thing to watch and so despite the cold I stay till late into the afternoon. On the way out I pick up two young hitchhikers travelling to Porvenir where they’re camping in someone’s garden. They’re from Switzerland and are taking time to travel before making the decision to go to university. They talk with an easy friendliness that I never had at their age. I enjoy the company but find myself envying their calm outlook. I wish them well when I drop them near the town’s bank, then I feel a little empty as they walk away leaning into each other, just like the penguins had.